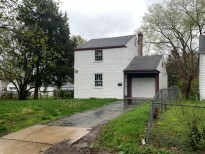 View - 1915 N Sharon Av. Nice home on near west side convenient to downtown and bus line. Home features a good size attached garage that provides ample storage. Driveway parking and low maintenance vinyl siding.